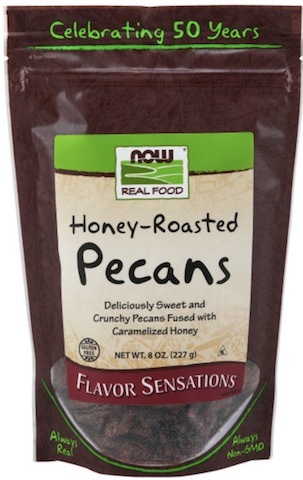 Ok, we may be embellishing a bit, but NOW Real Food® Honey-Roasted Pecans truly are one of nature's tastiest sensations. There's nothing quite like the sweet and caramelized flavor you get with this magnificent merger, kind of like Grandma's best pecan pie. Our Honey-Roasted Pecans make a great addition to ice cream, yogurt, smoothies, and other delectable delights. No artificial additives or preservatives, just the delicious taste of caramelized honey and pecans in perfect harmony. Directions: Refrigeration recommended after opening. Ingredients: Pecans, Cane Sugar, Non-GMO Canola Oil, Honey. This product is produced in a GMP compliant facility on shared equipment that also processes peanuts.